The signing ceremony of the Japan-funded nuclear security project for the National Science Center Kharkiv Institute of Physics and Technologies (NSC KIPT) was held on April 22, 2011 in the capital of Ukraine, Kyiv, with the attendance of the government officials.Secretary-General Hajime Sasaki, Technical Secretariat, Japan-Ukraine Committee on Cooperation for the Elimination of Nuclear Weapons Reduced in Ukraine, signed the Financing contract for implementation of the Project, total amount of which is 175 million Japanese yen at the ceremony. Earlier in January 2011, the Implementing Arrangement on this joint Project was signed between the Committee on Cooperation for the Elimination of Nuclear Weapons Reduced in Ukraine and the National Academy of Sciences of Ukraine. Also, the Project was mentioned in the “Joint Statement on Japan-Ukraine Global Partnership”, which was announced on the occasion of the Ukrainian President Viktor Yanukovych’s visit to Japan in the same month. The NSC KIPT, being under IAEA safeguards since 1998, is the largest scientific institution in the field of research and development of nuclear and radiation technologies in Ukraine. 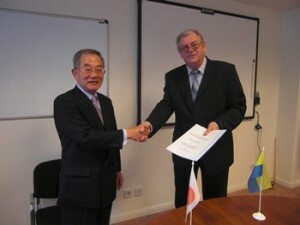 Given the importance of the facility in the light of non-proliferation, the Japan-Ukraine Committee has decided to support the establishment of the mass-spectroscopy system for identification of the bulk-form nuclear materials, which have been kept in the Facility since the Soviet era, as well as the upgrade of the perimeter protection system for addressing the growing threats of terrorism. The assistance is also expected to bolster the country’s own efforts in strengthening nuclear security. This bilateral Project is a part of the global efforts under “the G8 Global Partnership against the spread of weapons and materials of mass destruction” adopted at the Kananaskis Summit in 2002.